When I was asked if I could like to participate in a blog tour for Josi S. Kilpack's latest book, Blackberry Crumble , I replied with a hasty YES! Blackberry Crumble is the fifth book in this culinary mystery series, the first being Lemon Tart . I had heard of Lemon Tart when it first came out and was very curious about it but never got around to reading it. I was excited and happy to be able to dive in to this series, and I hoped that it wouldn't be a problem to hop into the later part of a series instead of on the first title. Blackberry Crumble arrived on my doorstep and I hastily dove into it. Admittedly, when I got started on it I wasn't sure it was such a great idea to have started on the fifth book. There was a lot of history and background that I was clearly missing out on, but that Kilpack provided some background for -- for about eight chapters! I was beginning to think I had made a big mistake and was going to have to set aside the book but decided to press on because I still like the idea of it. This culinary mystery revolves around fifty-something year old Sadie Hoffmiller, who seems to have a knack for being drawn into suspicious situations that need answers. Her character kind of reminds me of a mixture of Mrs. Emily Polifax and Jessica Fletcher of Murder She Wrote. Sadie Hoffmiller is a retired school teacher who lives in the town of Garrison, Colorado. She enjoys cooking and takes great delight in trying new recipes and sharing the joys of food with others. She is a widow with two grown children and seems to be in good standing with her community - until this story begins. Apparently in a previous book Sadie was involved in a murder mystery that is still working its way through the court system and therefore she is under a gag order and is not allowed to discuss the details of the case. A local reporter decides to raise speculation as to Sadie's involvement in this past murder and prints a humiliating article in the local paper raising suspicions as to Sadie's good character. In the middle of this embarrassment, Sadie is approached by a younger lady named May who would like Sadie's help in investigating the possible murder of May's father. Finding this a good excuse to leave town, Sadie flies to Portland, Oregon to assist May in this endeavor. After the first eight-ish chapters, I found myself very much engaged with the story and the characters. At times I did find Sadie's love of food to be a distraction to the story. (Recipes are interspersed into the chapters.) At the other times I found this fascinating and amusing, given the fact that she was experiencing Oregonian cuisine this time 'round. That, of course, exposed her to things like yummy fresh Oregon berry recipes as well as veggie burgers. Clearly, Kilpack was mildly amused by Oregon fare (and I do admit, living in Oregon myself now, that it does take some getting used to!) However, like I said, the character of Sadie reminded me of Jessica Fletcher and Miss Polifax so I quickly grew to accept her quirks. The story itself had a good many twists and turns and I was kept guessing as to the outcome of it all the way to the very end! Suddenly it all made sense to me -- in just the last few chapters! I love it when a book can entertain and surprise you so thoroughly. I would be very happy to read more books by Kilpack. After completing this read I looked up information about the author online and found Kilpack's website. I discovered that she is an LDS authoress and specifically writes to that audience. As a Christian, clearly I have fundamental theological disagreements with her. That said, it also explains why Sadie's morals and character are so upstanding and why there is not a hint of foul language or suggestive material in this entire book! I expect Kilpack's other mystery stories are equally clean. I love a good clean mystery and this book definitely fit the bill! Kilpack's characters do all attend the same church, but she does not spell out which church it is. If you are at all familiar with LDS churches or theology, you can catch hints about what Kilpack's beliefs and practices are during the read. I do feel the need to point this out but I also would say again that I feel I can trust Kilpack's mysteries to be fun without being remotely profane and I definitely appreciate that! I believe it is safe to recommend this series. Kilpack's next title in this series comes out in the fall of 2011 and is entitled Pumpkin Roll. I'd rather like to read it, but first I may have to catch up a bit and start with the first book - Lemon Tart . I received an invitation to participate in this book tour through Pump Up Your Book publicity tours and I thank them for asking me to be involved! I very much enjoyed the read! I often pick an audio book randomly...hoping it will be clean and a worthy listen-to, including in the kitchen where my little ones might overhear the text without truly listening. I am quite certain I have Lemon Tart in my bag from the library! I'm SO glad to know I can actually listen to it...and it sounds like I will be looking for the rest of the series, too! Are you familiar with Lilian Jackson Braun? Also mostly clean (probably less than 5 mild curses per book, no sexuality)...and quite enjoyable...or at least they were years ago when I read and listened to the series. will have to check this series out I loved diane mott davidson and always looking for new series and authors. hope all is well and your able to get some rest!!! 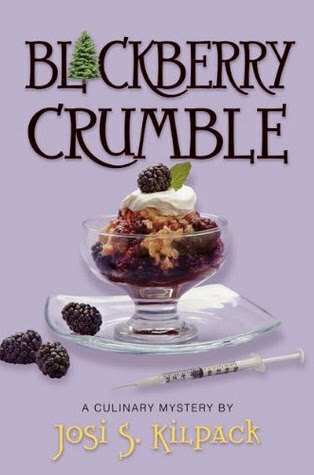 If you want to read the entire series, here's the order: Lemon Tart, English Trifle, Devil's Food Cake, Key Lime Pie, and then Blackberry Crumle. These sound like a fun read. Especially if you are a foodie.